These words of wisdom don’t just apply to children at play; they ring true in the work environment as well. “Horseplay” on the job may lead to injuries and accidents — some even with deadly consequences. For example, any tool tossed at or toward a coworker has the potential to injure or possibly kill. An injury as the result of horseplay in the workplace may need to be recorded on your OSHA 300 log if it meets the standard for recordability. Even though most employers would like their employees to bond and actually enjoy the work they do, some social interactions should be prohibited by policy. One such example is horseplay in the work environment. So, what types of behaviors constitute horseplay? It is behavior that puts the person or others at risk, such as roughhousing, practical jokes, pranks, fooling around and so forth. This might include running, chasing, pulling, throwing tools, driving forklifts recklessly, using equipment improperly, distracting those operating heavy machinery, hiding personal protective equipment, turning the lights off — and the list goes on. All these activities distract employees from risks that they may have otherwise seen. Some workers pull pranks on the new employee, and some interactions could border on workplace bullying. Communicate to your employees about the dangers associated with jokes that get out of hand or careless goofing off on the job. Stress the impact of one’s actions and the remorse one might feel if something should happen to a fellow employee because of a thoughtless endeavor. Just because you think nothing will happen doesn’t mean someone won’t get hurt. Don’t be the “idea person” to initiate the activity. Don’t be persuaded to participate. Don’t look away when you see potential dangers — report it! 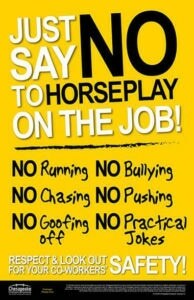 Remind employees that those engaging in horseplay are subject to disciplinary actions.